If you want a ticket to win a new Royal Enfield C5 motorcycle, today is your last chance. "We're shutting down the online ticket sales Friday night," advised Marc Hayes, admissions director at the Caepe School, in Arizona. The drawing for the red motorcycle is Monday. Raffle tickets are $25 each or two for $40. A maximum of 1,000 tickets will be sold. You can buy tickets online at the school's web site (as long as you're at least 18, a legal resident of the United States and NOT a resident of California). The complete rules are listed on the web site. The prize motorcycle is a red Classic 500, U.S. importer Kevin Mahoney told me. It comes with electric start, electronic fuel injection, unit-constructed engine and a frame painted in the body color. 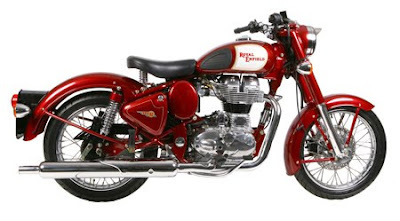 It is the most expensive Royal Enfield model, at a suggested retail price of $6,850. Does the winner get the C5 shipped to them or to a nearby dealer? Will setup be extra or on my own dime? I'll let you know -- after I win it! I'm a shoe in since I just bought a second RE and don't really need it. if you won it, they have a parent at the school that owns a shipping company, they will send it to you for free as well. did any one on here win it? Something must be wrong with my phone because there was no message from them that I won it. Seriously, with what I've been reading on the CMW forums, I'm mostly glad I didn't win it. The C5 and G5 still exhibit teething traits that are laughable compared to modern motorcycles, even though RE is trying to modernize the motor and reputation.